How to bring leadership inspiration & follow-up discipline? 20% of what you say and do creates 80% of engagement. 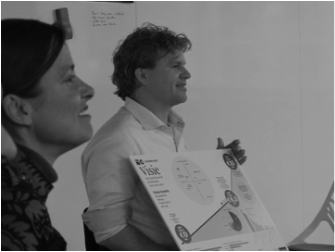 Co-creating a short strategy message that is understandable, inspiring and visually attractive for all people in the organization is a key to create strategically aware, engaged and inspired organizations. Energy follows attention: people and ideas. 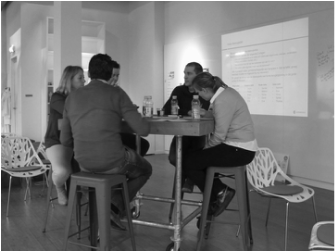 Your leading coalition usually consists of management and some organizational energizers, such as talents, high-potentials or other people that you would like to engage. They act as ambassadors and of the strategy story. What is being measured is getting done. 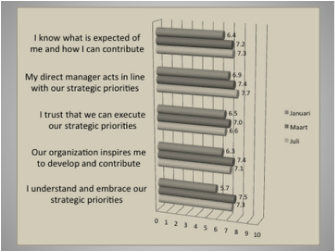 We use regular pulse-checks to measure strategy engagement; 3-5 relevant criteria around strategy awareness and leadership engagement. The pulse-check results serve as effectiveness measurement and input for next steps. If you want people to remember: repeat. Engagement around strategic priorities needs feeding. 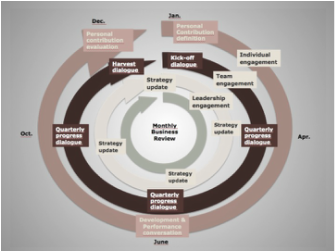 Strategic inspiration & dialogue moments need to be integrated into existing organizational routines like performance management and budgeting processes.